There is no better way than to cool down on a hot summer’s day in Sydney than to splash about in some water. 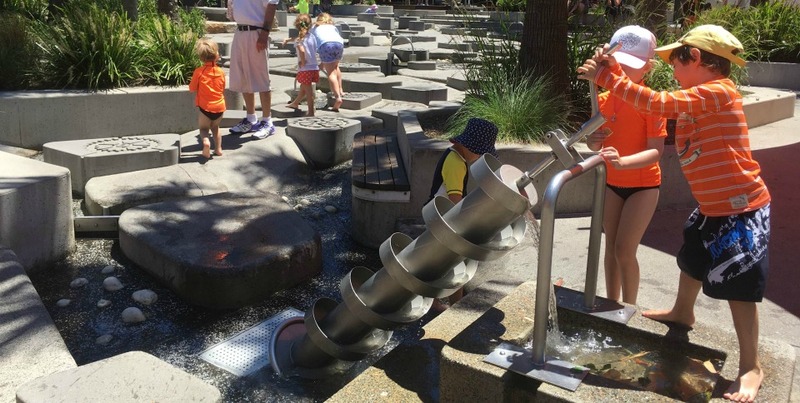 The Darling Quarter Water Park and Playground offers ample opportunity to keep wet and cool. There is a small kiosk which sells delicious coffee, babycinos ($1 with accessories: marshmallows and chocolate) they also sell toast with various toppings, burritos, toasties, hotdogs, corn on the cob, smoothies, muffins and banana bread ranging from $3.90-$8.90. There is a toilet right behind the kiosk, and one in the Monkey Baa Theatre (30 meters away) these are really clean and have a baby change facility. Mum’s Favourite: The kiosk with delicious coffee so close to the play area. Most Funny Moment: Lying on the fountains when they start to spurt water. Practicality: There is a lot of shade over the seating area and near the sand pit. There are several Wilson car parks in the area, or get a bus to Elizabeth Street and walk down or a train to Central station and just walk through China Town/ Paddy’s Market. TIP: If you visit one of the main attractions eg Aquarium, Wildlife Park you can get a discount on your parking. If you ‘Book a Bay’ with Wilson Car Park before you go on a weekend they offer an all day deal.